I know what you’re thinking—trade shows?! How old school. With endless rows of booths, stacks of pamphlets, and thousands of people crowding the aisles, trade shows don’t exactly have a reputation for being trendy. Despite not being the most enticing form of marketing these days, the trade show industry is expected to grow 2.8% in 2018, driven primarily by economic and job growth. What’s more, companies are continuing to send employees to trade shows as a way to treat them to an industry event, while getting some work done in the process. When employees attend trade shows, morale is boosted, new contacts are made, skills are improved through educational seminars, and hopefully, sales leads are generated. A study by Meeting Professionals International found there’s a 40% close rate for meetings conducted in person. The industry continues to prove that face-to-face marketing isn’t entirely replaceable—and will likely never be. When it comes to trade shows, startups often overlook them and opt for cheaper online alternatives, due to budget or logistical constraints. But after pushing through the aisles, winning a few attendee contests, and participating as both an exhibitor and attendee on different occasions, it was clear that trade shows are worth the time and investment. Industry influencers and bloggers walk trade show floors to gain insight into the best, brightest, and most up-and-coming companies and trends. Cold emails to influencers may never be opened, but an interesting booth and a clever sales hook may spark a genuine conversation with a press representative, giving you an even higher return on your marketing spend than you imagined. A prequalified customer is one who has traveled, spent money, brought a friend, or made an actionable investment to participate. Trade shows are swarming with people who have opted into the experience, and 84% of them have the power to recommend, specify and/or make real purchasing decisions. The trade show floor is the ideal place to engage with customers who actually care about learning more about the companies that are exhibiting. Watch and learn, literally. 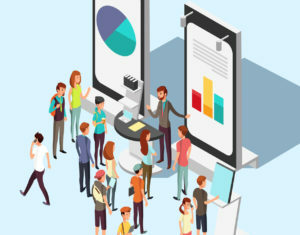 Trade shows offer a unique opportunity for you to see how attendees interact with your product and hear the questions they ask, so you can get a deeper understanding of your ideal customer. Use the trade show experience to gain insight into new features to add to your product, to see how your customers use your product, and to get valuable testimonials and feedback. As trade shows offer a great opportunity to introduce new products and services, you also can use the experience to become more aware of how your competitors are positioning their products. Also, it’s important to be at the same shows as your competition in order to be considered a viable alternative for potential customers. Turn on that trade show charm and build new relationships that exist offline. Trade show floors are flooded with CEOs, C-suite executives, investors, and customers. You never know the power of one great new contact, so remember to engage in meaningful conversations with everyone you meet. Yes, trade shows can be expensive, but the value they deliver in terms of leads, network, and feedback over a short period of time can be worth the extra dollars. In the startup world, time is valuable, and using it wisely can make all the difference.